Still from short film JUDAS COLLAR. Photo by Jessica Wyld Photography © No Thing Productions. JUDAS COLLAR is an incredibly ambitious film starring eight camels and filmed in a searing hot summer in remote desert locations in Western Australia, with a skeleton film crew and a team of camel wranglers who endured eight flat tyres, two bogged vehicles and a blown head gasket on the camel float. Behind the scenes of JUDAS COLLAR. Photo by Jessica Wyld Photography © No Thing Productions. The film took out the jury prize at the Awards Luncheon at AFF. 81 films that were selected for the AFF short narrative program from over 2700 short films submitted. The win means that JUDAS COLLAR now qualifies for entry into the 92nd Academy Awards in 2020. “It was an incredible honour to win the Austin Film Festival,” writer and director, Alison James said. “Brooke and I attended four days of intensive masterclasses with some of the best writers in the world before receiving the Best Short Narrative Film award so we are both leaving motivated and inspired. 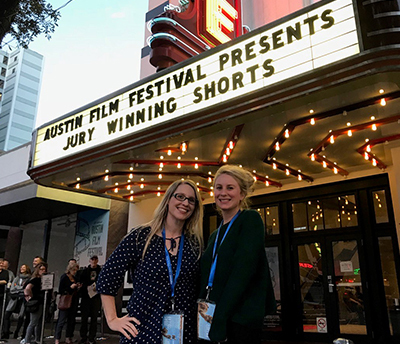 JUDAS COLLAR Writer/Director Alison James and Producer Brooke Tia Silcox at the 2018 Austin Film Festival. Alison also received a Special Mention for the ‘Rouben Mamoulian Award for Best Director’ at the 48th Sydney Film Festival Dendy Short Film Awards in July and was a 2018 AACTA finalist (Australian Academy of Cinema and TV Arts) for Best Short Film. “It’s really great to see our WA practitioners being recognised on the world stage for their exceptional work,” said Screenwest Head of Production and Development Matthew Horrocks. Producer, Brooke Silcox said, “The Award is testament to the talents of writer/director Alison James and the incredible team involved. “Alison changed the course of her life from documentary film making to scripted after learning and being deeply affected by the JUDAS COLLAR practice in Australia. Judas Collar was Developed and Produced with support from Screenwest and Lotterywest and Executive Produced by WBMC and Walker Films.